NeoPixel Weather Forecasting Umbrella #WearableWednesday « Adafruit Industries – Makers, hackers, artists, designers and engineers! 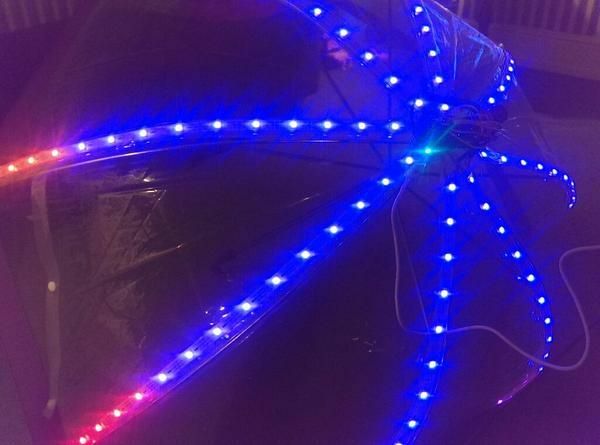 This weather umbrella from Sharon Mitchell is a happy discovery for me as it marries two things near to my heart–a NeoPixel umbrella and a weather umbrella. 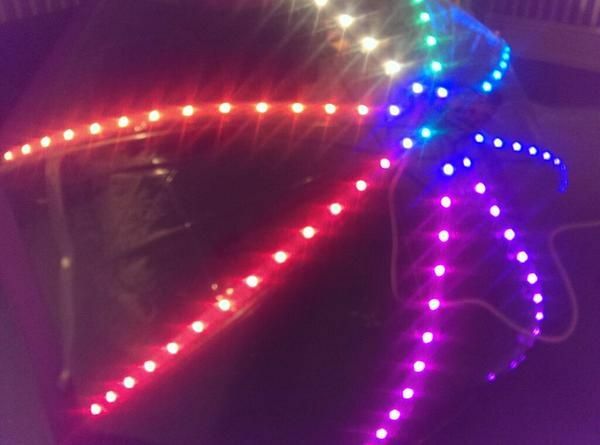 I already created a NeoPixel umbrella, but I was working on a Spark Core weather umbrella last year that would illuminate just the handle of the umbrella. I still haven’t finished that model, but thanks to Sharon, there is now code that may be helpful. This is a great example of how open source allows people to build off each other’s work. You can check out the details of Sharon’s work on her Instructable. She started with a breadboard prototype, which is the smart way to go, since you always want to test the LED strips and make sure the code is working properly. Since Spark Core is compact, and has the ability to connect to the internet, it’s a great microcontroller for wearables. 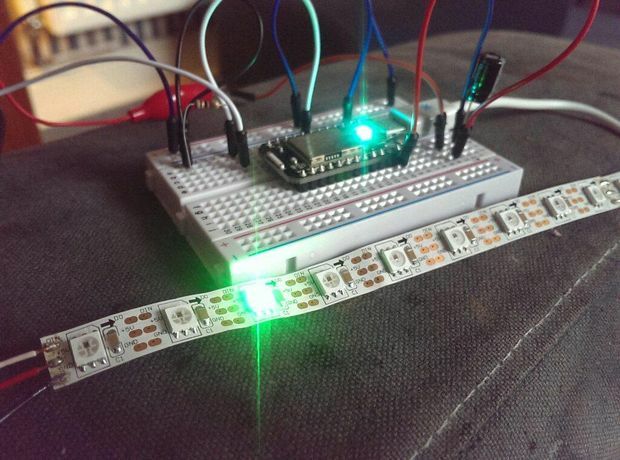 Sharon uses the Spark Core to fetch data from Open Weather and then use that data to trigger the color of the LEDs. So, rain would be indicated by blue LEDs, while snow would be indicated by white LEDs. I like how she uses purple LEDs for something unexpected. I always imagined that would be an end of the world indicator LOL. Here’s her umbrella in rain mode. This is really a super great project and I love the the look of weather mode. Sharon has hinted about future possibilities including controlling the umbrella through Twitter and having an accelerometer or tilt switch. This all just proves that there are far more possibilities for the traditional umbrella than companies think. Put an end to boring umbrellas with Sharon’s project or our FLORAbrella tutorial. The FLORAbrella uses a color sensor to match LEDs to your wardrobe. Experiment with other sensors and switches to make the rain your best friend. Don’t forget to send us a pic of your work.